I didn’t intend to write about this first leg of my trip. But if the remainder is anything like the first three days, I’m sure in for one heck of an adventure! My journey began last Sunday on the 09:39 Virgin Trains service from Milton Keynes to London Euston. Everything was pretty straightforward down to Paris, although the train had a fault and was running slowly. The business class offering with included lunch and bigger seats was great but I wouldn’t have paid extra for it if it had cost more than an economy ticket. Then it was a short walk over from Gare du Nord to Paris L’est to catch the Paris-Moscow express departing at 18:38 that evening. The Russian Railways service would take only 36 hours to cover the 3483 kilometres to Moscow, calling at Strasbourg, Berlin and Warsaw along the way. The trains are only two years old and are in immaculate condition. Second class consists of 4 berths to a compartment, and 8 compartments to a carriage. Each carriage has an attendant who ensures the comfort of passengers. He/she checks-in the passengers, sells snacks, provides hot and cold water and helps arrange cleaning facilities. It was evident early on that I was going to have problems communicating with the unilingual attendant so our conversations mostly consisted of sign language. The whole journey was very comfortable. I slept on both lower and upper bunks. The upper had the slight advantage of being softer and wider but overall I preferred the convenience of the lower one. It took me a while to comprehend the fact there was actually a shower in each carriage. It felt surreal, although ended up being more like a jacuzzi when the train was in full motion! the water was actually high pressure and hot so felt a country mile better than the one in my own apartment. All in all, based on comfort and service alone this train is remarkable value for a £180 ticket. And I’ve not even got onto the real gems of this journey yet. With the help of her previous experience and translation skills, a young lady called Ann helped me orient myself when boarding the train. 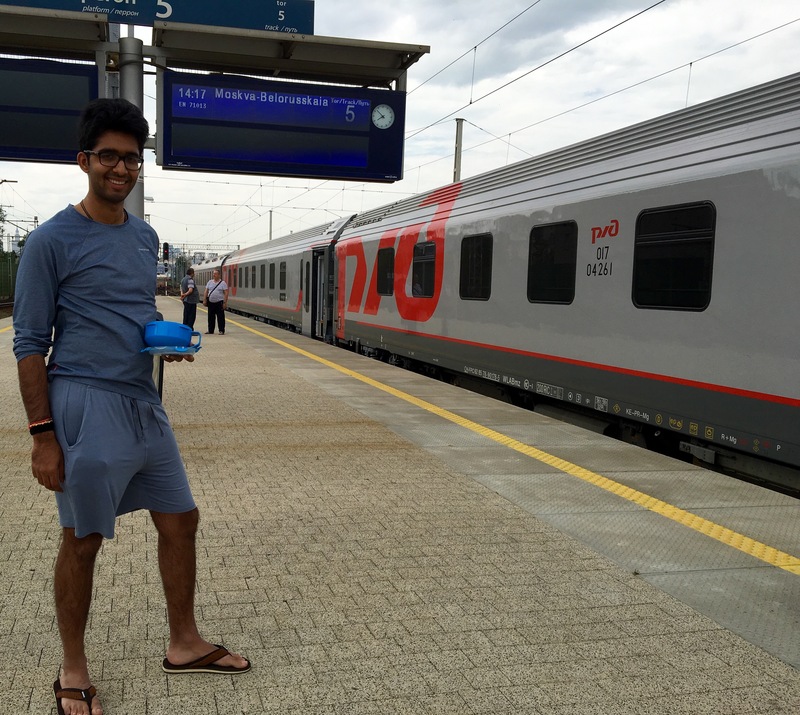 I shared a compartment with a young Russian couple called Alexei and Olga, who happily spoke fluent English. Throughout the second day we played a Russian card game called Durak which I was hopeless at picking up, and shared traditional savoury snacks whilst talking about Russian culture and sightseeing tips. Later in the day I had very engaging and extensive discussions with an 84 year old German Phd psychiatrist about everything from political crisis after WW2 to the current London housing crisis. On a venture to the dining carriage I met another vegetarian Briton struggling with Russian, who had unfortunately resorted to drawing pictures of fish and farm animals on a napkin with crosses through them to explain her plight. Having experienced this all too often myself, I came to her assistance and explained the requirement to the waiter in my finest (and perhaps only) Russian, after which we both enjoyed a decent veggie meal. Interestingly, though perhaps unsurprisingly, many of the passengers I spoke with were only onboard the train due to a fear of flying. Just behind the veggie lady I met an Irishman with his Ukranian wife who were exhausted having left from Dublin and were en-route to Crimea. It’s fair to say they found it rather bizarre that I was on the train just for the sheer fun of it! The European track gauge is smaller than the one used in Russia (143.5cm vs 152.0 cm). 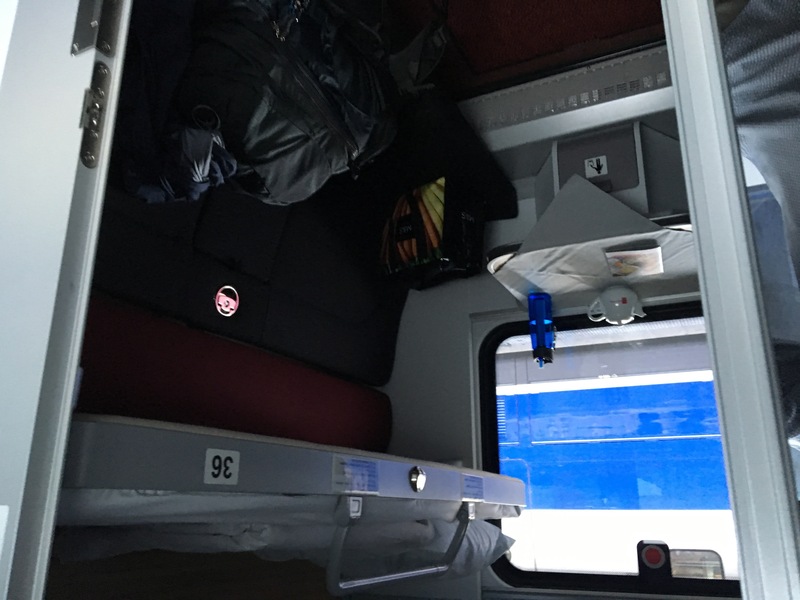 This meant that on arrival at the Belarus border, the entire train was directed into a service area to be jacked up and have the wheels replaced – with everyone still inside, of course. The procedure is incredible to witness, it runs like clockwork with the mechanics furiously hammering bolts and operating heavy machinery to see us on our way within in just an hour. Check out the video above to see how it’s done. Who you end up with on sleeper trains comes down purely to chance. There’s every possibility I could have shared a compartment without any English speaking passengers and endured a completely lonely journey. But I was lucky that my experience was the opposite. This, only the first leg in my journey, re-affirmed my belief about the pleasures of travelling the slow way and meeting people from all walks of life. It was an utterly unforgettable couple of days. Onwards it was to explore the city of Moscow. And within only 15 minutes of arriving I was in for a big wake up call..